"Water, water everywhere, nor any drop to drink" (Samuel Coleridge, The Ancient Mariner, 1798). This refrain has been true for centuries. Next to hypothermia, dehydration is a survivor's greatest danger. Never, ever, drink sea water! All that you will accomplish is to hasten your death. The RFD Navigator and basic unapproved rafts include no water or food. While lack of food is no big deal, lack of water is. Led by BFGoodrich which first convinced some dimwitted inspector from the FAA that a Katadyn PUR Survivor O6 watermaker was adequate, most of the manufacturers have deleted all the water from their kits. Admittedly it is heavy, but some water available for immediate use should be in every raft. Hoover still provides 4 per person rated capacity 1/8 quart/125 ml sealed pouches of water as well as a single desalter kit for their 6-person Part 135 kit. EAM, Hoover and Survival Products in the kit with their 4-person raft include chemical desalter kits that make a bit more than 5 or 7 pints of water each (depending on the size of the kit) through a process where the salt is attracted to the chemicals, leaving barely palatable, but safe, water in the bag. They take an hour to produce a bit less than a pint of water. They are something of an anachronism. When silver, a principle ingredient, was cheap, they were not expensive. Now they also have the drawback of costing a lot. A better answer is the Survivor-06 manually operated reverse osmosis desalinator pump (also referred to as a "watermaker"). This miracle of modern technology was first developed for the military and is only made by Katadyn North America (formerly PUR and before that Recovery Engineering). You literally transform salt water into pure fresh water by pumping it though a special membrane at very high pressure, leaving the salt on the other side of the membrane. The Survivor-06 (the smaller of two available) weighs 2.5 lbs. (about equal to 3 pints of water), has virtually unlimited capacity and can produce over a liter of water an hour. Pumping it will build up your biceps, but you will not run out of water or suffer dehydration. The Survivor-06 has become standard equipment in many Part 135 kits and is at least offered as an option by all the manufacturers. Some, Like Winslow, BFGoodrich and Survival Products build it into the cost of the Part 135 SEPs. Air Cruisers includes it as an option, ours were so equipped. Being able to delete all the heavy water in exchange for the more expensive Katadyn PUR 06 is an obvious advantage from a weight perspective. Unfortunately, it is not inexpensive, averaging $550 at retail. However, if we were king, it would be considered standard equipment on all life rafts. While the Survivor-06 is excellent, it does not obviate the need for some minimal quantity of water being readily available immediately upon boarding the raft, whether for taking sea sickness pills or dealing with other medical problems. With an 06 on board, we consider one packet per person to be adequate, one packet per two persons to be the absolute bare minimum. TIP: The Survivor-06 watermaker is a super piece of equipment, but I suspect few have ever used it over long periods. It may keep you alive, but you will be hurting from pumping it. Few people seem to know that there is a military version of the 06, the 06-LL, that is much easier to use because it has an extension for the pump handle, giving additional leverage and an extension for the pump body with a Velcro strap to secure it to your leg while pumping, so you don't have to use both hands. Together these two additions make a huge difference in ease of use. The down side is that it costs nearly half again more than the standard unit and is just slightly more bulky and weighs a bit more. However, having used both for long periods in testing, I wouldn't hesitate to insist on the 06-LL in my raft. Manufacturers should at least let customers know about the option. One of Air Cruisers' big selling points has been that these rafts have an extended service interval compared to the rest of the industry. We'll cover this issue a bit further on, but one item bears discussion in this section. Air Cruisers claims that the Survivor 06 requires service only every three years. Based on our experience with this product, we were skeptical of that claim and after we started investigating the subject. As a result of our queries, Katadyn PUR reviewed the matter and issued a policy to clear up any questions. Nathan Mueller, Katadyn's Associate Product Manager, told us that two years is the maximum recommended service interval for civilian aviation use, without exception, including Air Cruisers. Air Cruisers, for their part, has a letter issued by Mueller some time ago, shortly after he joined the company, that could be interpreted as supporting their claimed three year service interval. We were allowed by Air Cruisers to view this letter under a non-disclosure agreement, so we cannot reveal the exact contents of the letter or post a copy of the letter here. Mueller told us that this letter was issued in error and is poorly written, lacking some explanatory details. In any case, Muller indicates that allowing the service interval to extend to three years is more likely to result in equipment failure or significantly reduced water output (same thing in our mind) and more likely to require the replacement of expensive components when serviced, significantly increasing the cost of service. From our perspective, and experience, we'd side with the manufacturer in this matter and in our opinion do not consider Air Cruisers' extended service interval for the 06 to be acceptable. Air Cruisers also includes a bottle of Potable Aqua tablets to purify fresh water. All the TSO'd rafts with Part 135 kits, except RFD, include some means of collecting or making water, not all provide a means to store it. EAM provides an 8 x 24 inch plastic water storage bag. Winslow provides a two gallon plastic water storage bag with handle and spout. BFGoodrich includes a 1 quart plastic water storage bag with a spout. Hoover, Survival Products and Air Cruisers don't provide any dedicated means to store water. Conceivably, the 1-pint bag included with the desalter kits in the Hoover and Survival Products 4-person kits could be pressed into service for water storage, but we don't consider that the best idea. Given how light and inexpensive a water bag is, we find it unacceptable that one not be included. Food is not nearly as important as water for survival, but it really helps moral and in cold weather, assuming everyone isn't so seasick they can eat. Part 135 includes the requirement for a two day supply of food rations with at least 1000 calories per day per person. The manufacturers take two disparate approaches to meeting the ration requirements. All the manufactures except Air Cruisers use bona fide SOLAS and USCG approved, vacuum packed survival rations (by S.O.S. Food Lab) in their Part 135 kits. These are designed to provide some semblance of balanced nourishment that is optimized for those operating in survival conditions and with minimal water. Winslow also includes 250 calories per person in their "Basic" Part 91 general aviation SEP. While not exactly gourmet fare, these rations taste reasonably good and don't seem to make you particularly thirsty. They are somewhat oily/greasy, care must be taken not to make a mess with them. Air Cruisers uses a military survival ration in their kits, proof that mil-spec doesn't always mean top quality, or even very good at all. The contents of each pouch include a pair of granola bars, a corn flake bar, shortbread bar and chocolate chip desert bar, along with a roll of wintergreen Life Savers and a packet each of sugar, instant tea and chicken flavored soup and gravy base. The instructions on the package caution that the soup base should not be used if you are exposed to, or have swallowed salt water. That's hardly appropriate for life raft use. We found the bars to all be very dry and highly thirst provoking, again not an attribute you want in a life raft survival ration. While the packets could be consumed without any water if you are starving, they are inherently designed to be mixed with at least some minimal amount of water, again, not appropriate for life raft use. Upon unpacking the Air Cruisers SEPs we found a number of food packages ruptured or damaged, apparently in packing the raft, and the food already spoiled. 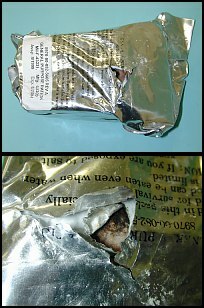 Another package that appeared to be OK externally, turned out later to have had water inside which dissolved the sugar and Life Savers and turned the interior of the package into a gooey mess. We find the Air Cruisers survival rations to be unacceptable in our opinion. TIP: Hoover, until recently, and EAM, prior to December 1993 and BFGoodrich in their old style Part 91 kit where food wasn't explicitly required included Charms, a hard candy, virtually 100% sugar. Hoover says they included enough Charms to meet the regulations, but our first test raft included only a single bag with seven 1 oz. rolls. Perhaps they simply forgot to pack the rest. In any case, after talking to Hoover, they sent a copy of their approved drawings which note, "1. Ten block per packages 2. approximate 130 calories per block equal 1300 calories per package." This didn't add up for us since our nutritional sources computed 1 oz. of sugar to be equal to about 113 calories. Checking with Tootsie Roll, who manufacture the Charms candy, we spoke with the President, Ms. Ellen Gordon, who told us authoritatively that each 1 oz. square roll of 10 candies contains 112 calories. So, aside from the fact that we were shortchanged even by Hoover's normal provisioning, it would seem that Hoover is also off by about 16% in their computations. Depending upon how many they actually packed, that may or may not present a violation of the FARs for anyone using one of these rafts. EAM, in their old Part 135 SEP, included only a single package with 12 1 oz. rolls of Charms. On the package EAM rather optimistically proclaims that, "The food in this package will feed 5 persons for 1 day or 1 person for 5 days." That would be a lot out of 1344 calories total. EAM also voiced surprise that we hadn't received more packages, but even so, they would seem to have been even further off the mark than Hoover. In any case, we are glad everyone has has changed to real rations. The Charms, in our opinion, are simply inappropriate and probably inadequate by any measure. Those with older rafts should seriously consider replacing the Charms with real rations at the next service.